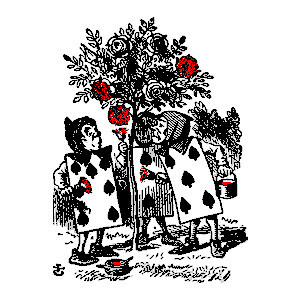 As Alice explored Wonderland, she happened upon three gardeners in the form of playing cards busily painting the queen’s white roses red. 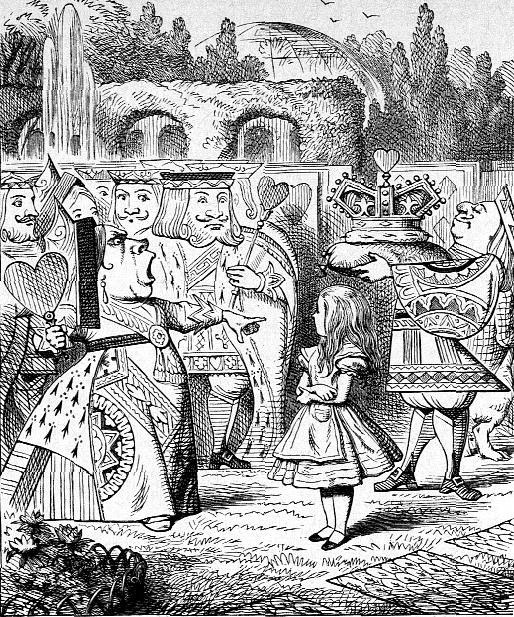 When she asked them why they did this, they explained that they had planted white roses by mistake, and were frantically attempting to conceal the error with red paint before the queen found out, lest they lose their heads. For many women, aging means a buffet of life-changes in multiple courses, many of which are sometimes difficult to swallow. 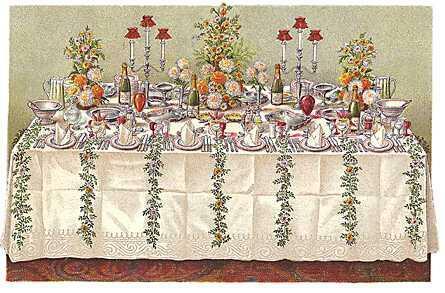 Oddly enough, the Smorgasbord of life begins with a feast of desserts! Sweet and palatable, Youth is oblivious to the effects of age, coming with a devil-may-care attitude, a sense of indestructibility, and of time standing still. As one grows into young adulthood, one eases into appetizer trays rich with deep-fried flavor, unhampered by worries of clogged arteries, or muffin tops. Following earlier, carefree times are meat and potato entrées that may consist of choosing a companion, furthering one’s education, pursuing a career, and the responsibilities of family life. A jog around the block pushing a stroller keeps one fit and one’s thoughts far from the vultures of time and gravity waiting patiently to pounce on the carrion of one’s future. One’s thoughts may wander to advanced age, but possibly only in reference to asking grandparents to babysit. Middle age is the time for salads and smoothies—watching what one eats, and guarding one’s health. Finally, during advanced years, one dines on entrails (innards). Awareness of the aging process becomes more difficult to ignore during the entrails course since as one gets older, one’s bodily counterparts to innards tend to become more outspoken. In addition, evidence of other aging issues may be hard to swallow—even when “painted red” by tucking, squeezing, dying, exercising, studying, meditating, or moisturizing. Body shape and size, hair, skin, attitude, behavior, mental acuity, physical capacity, and other sundry changes are inevitabilities of life, leaving bare chicken bones and crumbs from the feast on the plate for one to shiver at with dismay. 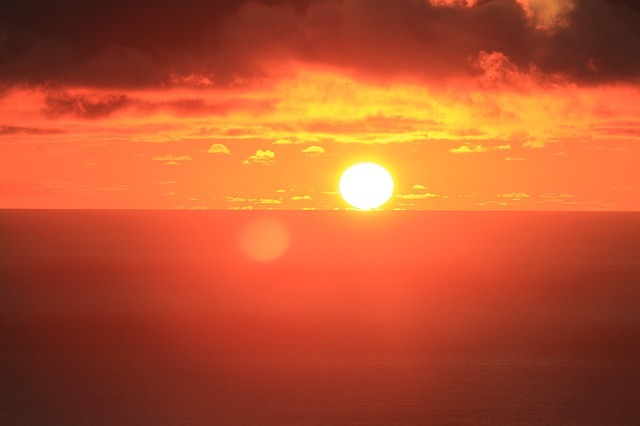 During a discussion with my oral hygienist one morning, she declared that of all the changes that come with aging, the loss of pigment is the saddest for her. (She was referring, of course, to her hair.) My reply to this was, “I haven’t lost my pigment. It has relocated: from my head to spots on my face.” We laughed about it, but it is one of the unsettling facts of life that aging has a way of shifting things around, such as pigment, muscle tone, and the “F” word: FAT. Although my weight is the same as what it was in my youth, how it is distributed is startling and a bit discomfiting. Even dendrites—the neural networks of the brain—are sometimes rearranged or reduced in number and efficiency, wreaking all sorts of havoc for some poor aging souls. We talk about ‘growing old gracefully,’ but what does that really mean? Is it referring to one’s appearance, one’s mental or emotional state, or one’s behavior? I suspect, all. The glaring feature prompting this chant was my hair. Truthfully, I was never proud of this feature. My hair had always been dark brown and wildly curly—in a frizzy, windblown sort of way. When I was a teen, straight hair was in, and mine was not. I never ironed it, (though it was faddish to do so), nor did I do anything drastic like that, but I did go through time-consuming gyrations to smooth and straighten it out. Inheriting genes for prematurely gray hair, at age fifteen, I held a single strand between my fingers, announcing to my peers, “Look! A blonde hair!” That’s when the mindset that led to ‘painting the roses red’ began. I was in denial, even as a teen. In my early thirties, I was appalled to see myself in a photograph wearing whitish earmuffs on either side of my face around the area of my temples. I wasn’t ready to be gray by thirty-five, so I began the unhappy task of painting the roses red. I didn’t want to be a blonde, or a redhead. I was happy just being what I had always been: a brunette. After thirty years of applying layer over layer of my “natural” color to mask the gray, (no salon for me—I did it myself), I found I was finally sick and tired of being a slave to white roots. They are persistent and devious—making paparazzi appearances at the least opportune times. 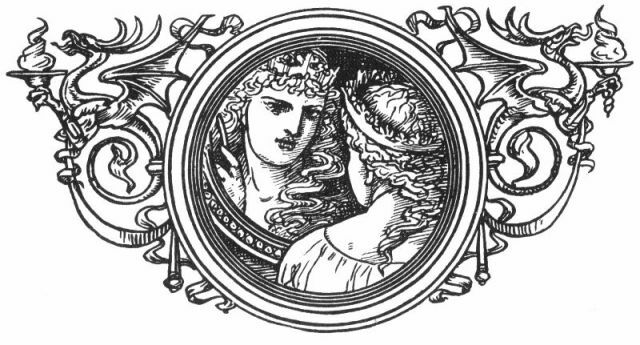 Standing in front of the mirror, I wondered if I had strayed from the graceful path of aging. Is covering gray, or accepting it for what it is, considered graceful? I’m not sure I know the answer to that question; one must answer that question for oneself. 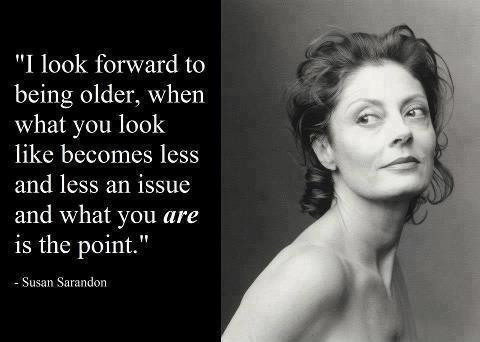 I do believe growing old gracefully encompasses physical, mental, emotional and behavioral aspects of oneself. I have always envisioned it as meaning one gratefully accepts the inevitable, and makes the most of each blessed day of life—living optimistically, fully, joyfully, and trusting in the eternal plan of a loving Heavenly Father. In response to my idea of gracefully aging, I believe it really doesn’t matter if one paints the roses red or not–especially if one finds joy in the process and outcome. Some might argue the “truth thing”—that one is hiding the truth, or deceiving others into believing one is what one is not. Really, now? Is it any different from wearing a little mascara, or blush, or from tanning creams, high-heeled shoes, or control-top pantyhose? A favorite author from my past said that ‘even a barn looked better painted,’ and that one should care enough about one’s appearance to repair broken fences, and add a coat of paint now and then. Who likes an eyesore? Part of taking care of one, and contributing to one’s self-respect is presenting oneself as clean, tidy, and well-groomed. For some, a spot of blush just might brighten one’s appearance and one’s outlook. At any rate, and thankfully, hiding one’s silvery roots won’t cause one to lose one’s head! It causes me to wonder why it seems such a big deal in the first place—at least to some (including myself). Just as one gradually ages, I have decided to ease my way into my ‘natural’ hair color—or lack thereof. The beautician who cuts my hair, told me I am one of the “lucky ones”—that my roots are silvery white (thanks to my mother), not salt and pepper gray. This “easing into whiteness” will be a gradual process, so as not to shock anyone (most especially so as not to shock me). 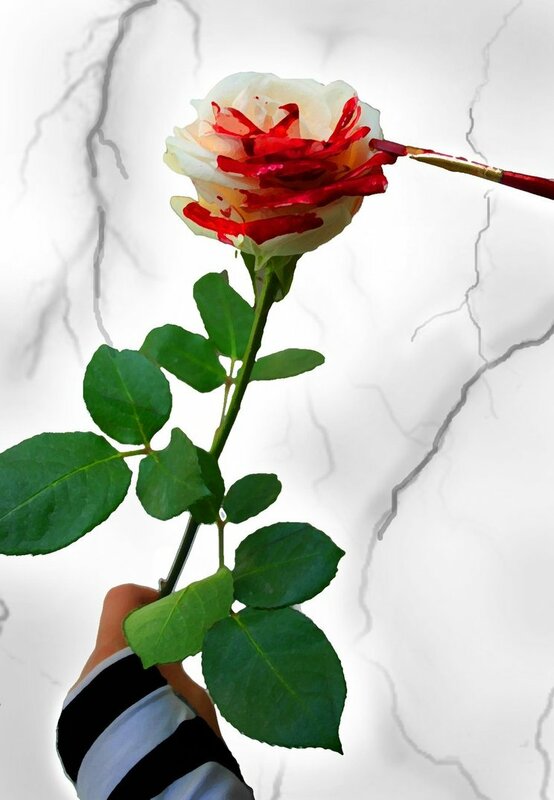 I will strip the roses of their red paint, and enjoy the beauty of the white roses. White roses have a beauty all their own, do they not? 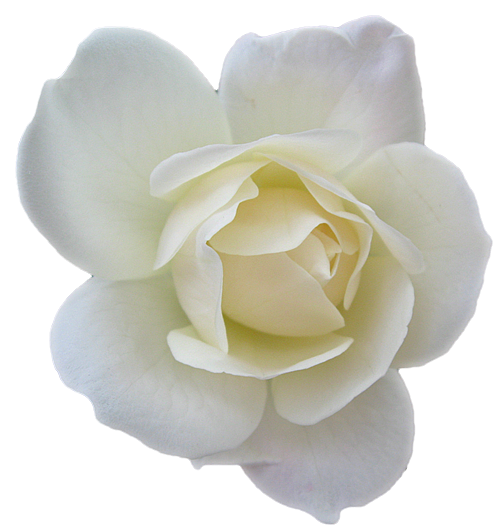 And a white rose, by any other color, will still smell as sweet. I will still be me. The me inside—my eternal spirit—still looks out of this aging shell of a body through sixteen year-old eyes. 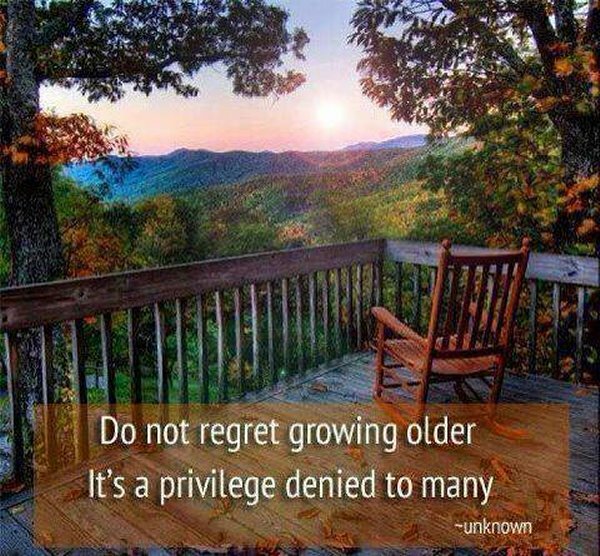 Perhaps therein we find the answer to the question of growing old gracefully. Perhaps growing old gracefully means living the truth of who and what you are within, no matter what alterations occur without. If this is the case, then growing old gracefully should begin in our youth, for shouldn’t we all live a life true to the values and attributes we cherish? Living true to one’s values means not allowing someone else to paint you red if you are truly white. I have begun the process of stripping the red paint from my white roses. Just as one liberates and refinishes an old piece of furniture as one strips layers of chipping paint and faded stain gradually revealing a naturally beautiful wood grain quietly enduring underneath, there is, likewise, a liberating and refinishing quality in tossing out the ‘red’ paint, and relaxing into the ‘white’ reality shining through. Like Alice, one might ask why paint over the white roses in the first place. I might ask myself the same question. I’m not sure the answer is as clear to me as it was to the playing card gardeners. I hope I don’t react like the Queen of Hearts and shout, “Off with her [my] head!” Perhaps a better question might be, will I come to appreciate and enjoy the white roses for their truth and beauty? Categories: Aging, Beauty, Growing Old Gracefully | Tags: aging, Alice in Wonderland, dying hair, growing old gracefully, hair, painting the roses red, red roses, silver hair, truth, white hair, white roses | Permalink.